Understanding the scale, location and nature conservation values of the lands over which Indigenous Peoples exercise traditional rights is central to implementation of several global conservation and climate agreements. However, spatial information on Indigenous lands has never been aggregated globally. Here, using publicly available geospatial resources, we show that Indigenous Peoples manage or have tenure rights over at least ~38 million km2 in 87 countries or politically distinct areas on all inhabited continents. This represents over a quarter of the world’s land surface, and intersects about 40% of all terrestrial protected areas and ecologically intact landscapes (for example, boreal and tropical primary forests, savannas and marshes). U.S. Department of the Interior. 2009. Adaptive Management: The U.S. Department of the Interior Technical Guide. The purpose of this technical guide is to present an operational definition of adaptive management, identify the conditions in which adaptive management should be considered, and describe the process of using adaptive management for managing natural resources. The guide is not an exhaustive discussion of adaptive management, nor does it include detailed specifications for individual projects. However, it should aid protected area managers in determining when and how to apply adaptive management. CoReMo software was developed by ARVAM with support from the French Overseas Ministry, Réunion Regional Council and the EU, and in close collaboration with the WorldFish Center, Penang, Malaysia. The software is fully interoperable with ReefBase and FishBase. CoReMo 3 is designed to help users enter and analyse data collected using the methods and protocols outlined in Methods for Ecological Monitoring of Coral Reefs. The aim of the present report is to provide a comparative assessment of commonly used pelagic sampling methods. We do this by undertaking a qualitative, yet comprehensive, review of the published literature to identify their potential advantages, limitations, and their relevance to monitoring efforts. A ‘silver-bullet’ approach to pelagic monitoring likely does not exist, nor is necessarily feasible. Instead, this comparative assessment provides a blueprint for guiding sampling activities in the context of pelagic monitoring efforts. Such information is essential to promoting transparency, repeatability, and standardisation across studies and institutions, so that method selection aligns with study objectives, with a clear understanding of benefits and limitations. Feinsinger, P. 2001. Designing Field Studies for Biodiversity Conservation. Island Press. This book explains how to undertake field studies to guide conservation work and is for anyone working in conservation regardless of their professional or scientific background. The methods and procedures of scientific inquiry are explained in a step-by-step manner. The author wants to make the process of doing science accessible and effective. The purpose of this book is not only to offer information, but primarily to catalyze the process of good thinking, so that readers can learn how to think and understand the importance of broad inquiry, no matter what the conservation project. How is your MPA Doing? Pomeroy, R.S., Parks, J.E., Watson, L. M. 2004. How is your MPA Doing? A Guidebook of Natural and Social Indicators for Evaluating Marine Protected Area Management Effectiveness. IUCN Gland, Switzerland and Cambridge, UK. Chapter 3 (pages 30 – 35) of this handbook contains a description of managing MPA data once it has been collected. It discusses the various steps of data coding, storage, entry and runs through the various types of exploratory statistics that are possible. There are brief descriptions of further analysis options. The chapter concludes with a discussion of the importance of ascertaining internal and external evaluation of results. 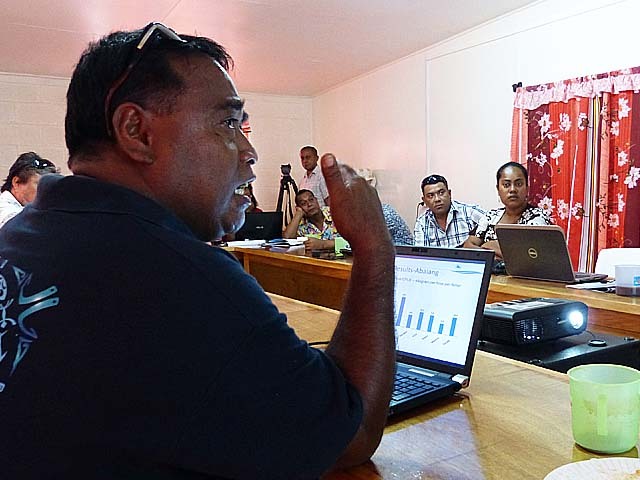 Improving Local Capacity for Coral Reef Monitoring Data Interpretation. A Guidebook with Step-by-Step Exercises Using Regional Datasets to Improve Local Capacity for Data Interpretation. Houk, P. 2010. Improving Local Capacity for Coral Reef Monitoring Data Interpretation. A Guidebook with Step-by-Step Exercises Using Regional Datasets to Improve Local Capacity for Data Interpretation. Pacific Marine Resources Institute, Saipan, FSM. 151pp. This comprehensive guidebook uses Microsoft Excel, Access, PRIMER-E, and Sigma Plot software programmes and runs through step-by-step examples with sample data sets provided. The guidebook has accompanying data sets and can be used for practise and training on data analysis and interpretation. Reef Check provides excel spread sheets with built in macros for carrying out preliminary data analysis. Pages 31-36 of their manual have illustrated instructions for how to correctly complete the spreadsheets with explanations of the output data. There is also a chapter discussing data analysis that explains how to interpret the results including the meanings of the standard error and the standard deviation. Larval dispersal is the key process by which populations of most marine fishes and invertebrates are connected and replenished. Advances in larval tagging and genetics have enhanced our capacity to track larval dispersal, assess scales of population connectivity, and quantify larval exchange among no-take marine reserves and fished areas. Recent studies have found that reserves can be a significant source of recruits for populations up to 40 km away, but the scale and direction of larval connectivity across larger seascapes remain unknown. Understanding the behaviour of humpback whale mother-calf pairs and the acoustic environment on their breeding grounds is fundamental to assessing the biological and ecological requirements needed to ensure a successful migration and survival of calves. Therefore, on a breeding/resting ground, Exmouth Gulf, Western Australia, we used animal-borne DTAGs to quantify the fne-scale behaviour and energetic expenditure of humpback whale mothers and calves, while sound recorders measured the acoustic environment. An increasing number of international initiatives aim to reconcile development with conservation. Crucial to successful implementation of these initiatives is a comprehensive understanding of the current ecological condition of landscapes and their spatial distributions. Here, we provide a cumulative measure of human modification of terrestrial lands based on modeling the physical extents of 13 anthropogenic stressors and their estimated impacts using spatially explicit global datasets with a median year of 2016. We quantified the degree of land modification and the amount and spatial configuration of low modified lands (i.e., natural areas relatively free from human alteration) across all ecoregions and biomes. With marine biodiversity declining globally at accelerating rates, maximising the effectiveness of conservation has become a key goal for local, national and international regulators. Marine protected areas (MPAs) have been widely advocated for conserving and managing marine biodiversity yet, despite extensive research, their benefits for conserving non-target species and wider ecosystem functions remain unclear. Here, we demonstrate that MPAs can increase the resilience of coral reef communities to natural disturbances, including coral bleaching, coral diseases, Acanthaster planci outbreaks and storms. Methods for Ecological Monitoring of Coral Reefs. A Resource for Managers. Wilkinson, C., Hill, J. 2004. Methods for Ecological Monitoring of Coral Reefs. A Resource for Managers. Australian Institute of Marine Science, Townsville, Australia and Reef Check, Los Angeles, USA. 117pp. There is a section on data handling and storage of results on page 14 of this resource. It covers data storage, analysis and reporting. There is also a discussion of the importance in involving the public in the dissemination of the results which can be a key factor in determining the success of protected areas. Wilkinson,C., Green, A., Almany, J., Dionne, S. 2003. Monitoring Coral Reef Marine Protected Areas: Version 1. A Practical Guide on how Monitoring can Support Effective Management of MPAs . Australian Institute of Marine Science, Townsville, Australia and the IUCN Marine Program, Gland, Switzerland. Chapter 8 (Page 49) of this guide on how to carry out effective monitoring of MPAs considers data storage, analysis, accessibility and reporting. There is a description of the 8 critical steps for data management which contain some useful advice for practitioners to consider prior to carrying out data collection. The persistent, non-native invasive alga Gracilaria salicornia has dominated the protected waters surrounding Moku o Loʻe, Kāneʻohe Bay since its introduction in 1978; however, a sudden decline in abundance (75%) occurred within a 30-day survey period. The consisent environmental conditions during the survey period, dominance of G. salicornia despite the presence of abundant herbivorous fish populations, and multiple observations of physical grazing by the green turtle, Chelonia mydas, on G. salicornia support our conclusion that C. mydas was the primary driver of the rapid decline of a persistent invasive macroalgae within a Hawaiian marine reserve. This report presents the results of the 2016 Funafuti Community-Based Ridge-to-Reef (R2R) Rapid Biodiversity Assessment (BIORAP) of biodiversity and ecosystem services (BES), hereafter referred to as the BIORAP. In this context the Tuvaluan translation for BES is “meaola mo vaega mea aoga kia tatou i te fenua mo te tai” (literally “living things and those things that are useful to us from our land and sea. This reflects the central theme of the Tuvalu R2R Project of “Connecting People & Ecosystems to Sustain Livelihoods” and reflects the Millennium Ecosystem Assessment (MA) (2005) definition of: “the benefits people obtain from ecosystems (MEA 2005). This report of 220 pages written by nearly 90 authors clearly presents the summation of an enormous amount of data and information on 19 of the 23 nations and states of the Pacific and outlines both the problems and stresses on these thousands of reefs, and the potential that these reefs will prove to be the reservoir of coral reefs for the world in the immediate future with the largest threat being global climate change. Although the following chapters illustrate that coral reefs in the wider Pacific are facing many threats and have shown significant losses of coral reef structure, this report clearly demonstrates that Pacific reefs without much doubt contain the best coral reefs systems in the world and should remain in that position for the immediate decades to come. Parties to the Convention on Biological Diversity (CBD) adopted 20 targets, known as the Aichi Targets, to benchmark progress towards protecting biodiversity. These targets include Target 11 relating to Marine Protected Area coverage and the World Database on Protected Areas (WDPA) is the accepted international database for tracking national commitments to this target. However, measuring national progress towards conservation targets relies on sound data. This paper highlights the large-scale misrepresentation, by up to two orders of magnitude, of national marine protected area coverage from two Pacific Island nations in multiple online databases and subsequent reports, including conclusions regarding achievements of Aichi 11 commitments. The 2018 UN List provides up-to-date information on marine and terrestrial protected areas globally, and identifies those protected areas that have been the subject of management effectiveness evaluations. Such evaluations provide a valuable assessment of the management performance of these areas: they help identify threats to the protected areas and inform mitigating actions; they help in identifying gaps in capacity, for example insufficient technical or financial resources; and they can identify where management actions are successful at achieving conservation outcomes and thus should be maintained. This report was a collaboration Science and Conservation of Fish Aggregations, University of Hong Kong, Fiji Ministry of Fisheries, Wildlife Conservation Society, and the University of British Columbia (Canada).We conducted a seafood VCA for the coral reef grouper (Epinephelidae) fishery in Fiji with the goal of understanding the distribution of value gained from grouper along the trade chain, from fisher to consumer. Our aim was to use the study outcomes to inform policy makers on how higher economic values and benefits can be derived from grouper for value chain actors, particularly fishers in Fiji. We highlight the overall value of grouper in Fiji’s coastal fishery and the importance of maintaining healthy populations into the future. The agricultural matrix has increasingly been recognized for its potential to supplement Protected Areas (PAs) in biodiversity conservation. This potential is highly contextual, depending on composition and spatial configuration of matrix elements and their mechanistic relationship with biological communities. We investigate the effects of local vegetation structure, and proximity to a PA on the site-use of different guilds in a wintering bird community within the PA, and in wooded land-use types in the surrounding matrix. We used occupancy models to estimate covariate–guild relationships and predict site-use. We also compared species richness (estimated through capture–recapture models) and species naïve site-use between the PA and the matrix to evaluate taxonomic changes.